although I didn’t installed on my NS because my company wants it to be accessible on the internet. 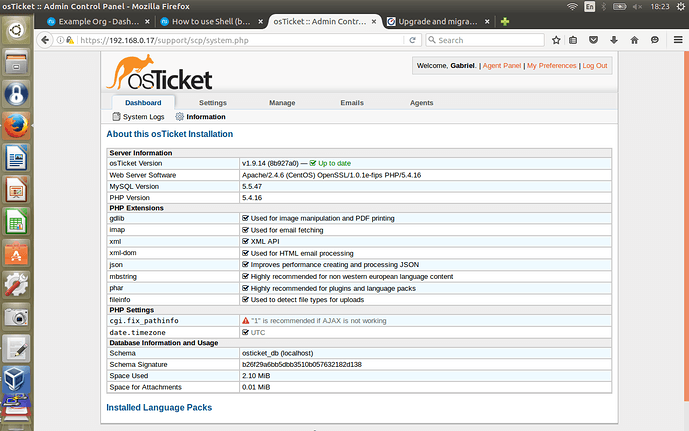 I have tried osTicket on NS 6.7 and worked. Like any other application which works on CentOS 6.7. Do you have some notes? We can start off with that! I found “How to …” with Google. I followed and inspired from this 3 articles and I have succeeded! If I remember well there are some mistakes, but if I have succeeded, any of you will do! @Artem_Voylenko have you test out some of these suggestions? Just installed on NS 7 alpha 3, for testing. Short descriptions of the steps. In the next days I will try to make a tutorial. MariaDB (MySQL) server and Web server modules installed from Software center. Follow instructions for secure MySQL (use one of the links from above posts, the steps regarding to secure MySQL). (if you have issues with SQL password, use instructions from here: https://support.rackspace.com/how-to/mysql-resetting-a-lost-mysql-root-password/). Download & install osTicket (use one of the links from above posts, the steps regarding to download and install osTicket). NS7a3 installed as VM (Oracle VM VirtualBox). Logged to NS7a3 through WebUI (https://192.168.0.17:980/en-US/Dashboard). No modules/packages installed on NS7a3 Administration -> Software center -> Installed. Logged to NS7a3 through PuTTY SSH Client (192.168.0.17:2244). Below are shown only the relevant commands. (should be “systemctl start mysqld” but after a few seconds, the “mysqld (MySQL database)” service goes to “Stopped”; the reboot was the only way that I knew, to move forward). Anyone who wants to improve this tutorial is encouraged to do so! I just finished this how-to and when I entered on site (https://192.168.0.17/support/scp) I saw that is an update available to version 1.9.14. 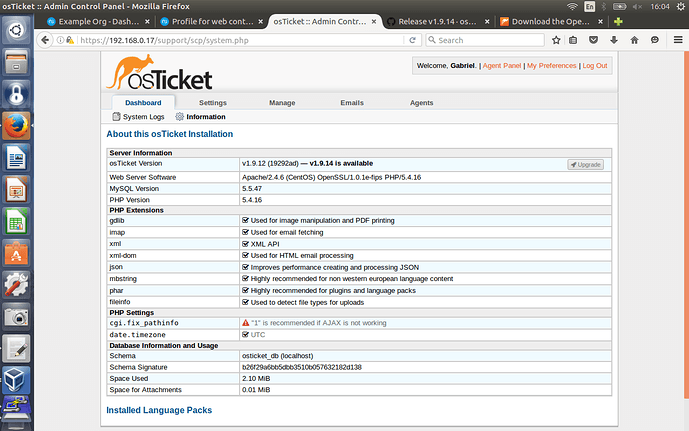 So, on step IV.3, you can replace “/osTicket-v1.9.12.zip” with “/osTicket-v1.9.14.zip” to install the last stable version. I will try to find how to make upgrade and I will make another how-to regarding “Upgrade”. l. Navigate to Admin Panel -> Dashboard -> Information and see the new osTicket version there. Yep, saw that. Just wondering id there was more info. Thanks.